This month we've been talking about heart health, especially for women. As family caregivers it's important to not only take care of your loved ones, but also yourself. Feeding your family a heart healthy diet is truly feeding them with love. Here's 7 tips to help you build a heart healthy diet. How much you eat is just as important as what you eat. It's easy to overload our plates, especially when we've been trained by restaurants to serve oversized portions that fill us beyond capacity. Try using smaller plates and bowls, and even using measuring cups to portion out your food. A few companies like Weight Watchers sell serving spoons that help measure out your food. Along with portion control, keeping a food journal can be helpful to see exactly how much you're eating. TIP: If you find yourself getting hungry, increase the portion of fruits and vegetables in your diet to offset the hunger and keep you fuller longer. Whole grains are good sources of fiber and can help in regulating blood pressure. 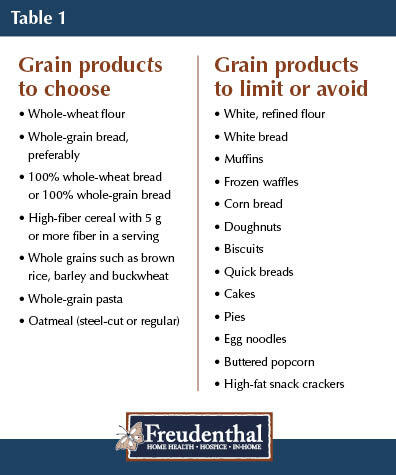 Increase the amount of whole grains in your diet by making simple substitutions for refined grain products. (See the Table 1) Or if you're adventurous, try a new whole grain, such as quinoa or barley. You can easily reduce the amount of saturated fat in your diet by doing little things like trimming fat off your meat or choosing lean meats. Adding less butter, margarine and shortening when cooking and serving can also help. TIP: Top your baked potato with salsa or low-fat yogurt rather than butter. When you do use fats for cooking, choose monounsaturated fats, like olive oil or canola oil. Just remember moderation is essential. All types of fat are high in calories. Leaner meats, poultry and fish, low-fat dairy products, and eggs are some great sources of protein. Be careful to choose lower fat options when you can. Fish is a good alternative to high-fat meats. Fish can be rich in omega-3 fatty acids, which can lower blood fats called triglycerides. Reducing the amount of salt you add to food at the table or while cooking is good, but did you know that much of the salt you eat comes from canned or processed foods? If you like the convenience of canned soups and prepared meals, look for ones with reduced sodium. Don't fall into the trap of items that claim to be lower in sodium because they are seasoned with sea salt. Sea salt has the same nutritional value as regular salt. Give yourself an indulgence every once in awhile. A small treat won't derail your heart-healthy diet, as long as you don't let it turn into an excuse for giving up. It's more important that you eat healthy foods most of the time. Adding these 7 tips into your daily lifestyle along with possibly planning out your weekly meal, will go a long way to helping you keep your family "heart healthy." Like we said at the beginning, you'll truly be feeding them with love!